The autobiography everyone has been waiting for: a shockingly candid and raw confessional from an international treasure. 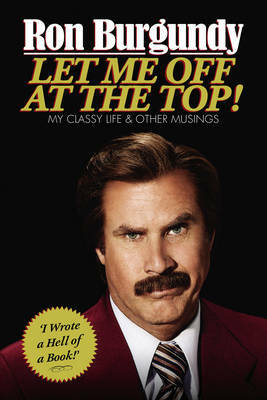 The world's most trusted and beloved television News Anchor, Ron Burgundy, pulls no punches in Let Me Off at the Top! Burgundy tells the tale of his humble beginnings in a desolate Iowa coal-mining town to his years at Our Lady Queen of Chewbacca High School to his odds-defying climb to the dizzying heights of Anchordom. In his very own words Burgundy reveals his most private thoughts, his triumphs - and his disappointments. His life reads like an adventure story complete with knock-down fights, beautiful women and double-fisted excitement on every page. He has hunted jackalopes with Bobby Kennedy and Peter Lawford, had more than his share of amorous exploits and formed the greatest on-air team in the history of televised news. Along the way, he's hobnobbed with people you wish you knew and some you honestly wish you didn't- celebrities, presidents, presidents' wives, celebrities' wives, dogs and, of course, Veronica Corningstone, the love of his life. Who didn't Mr. Burgundy, or 'Ron', as he is known to his friends, rub elbows with in the course of his colourful and often criminal life? This may well be the most thrilling book ever written, by a man of great physical, moral and spiritual strength and, not surprisingly, a great literary talent as well. We owe it to him, and to ourselves, to read it. With never-before-seen photographs. Some in colour!